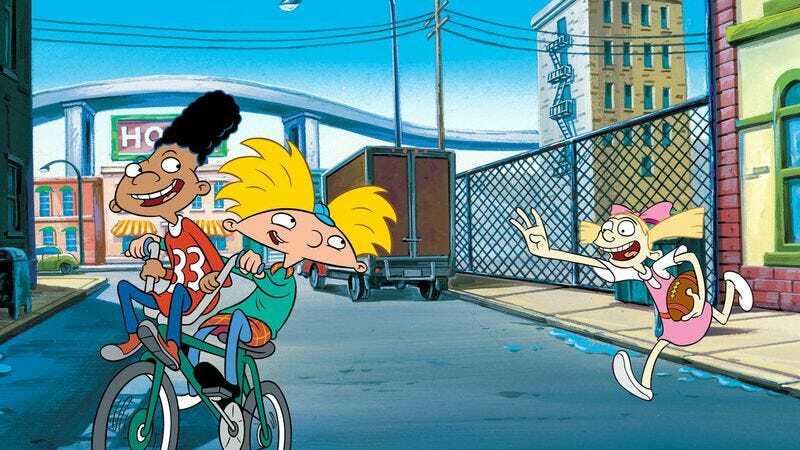 Earlier this fall, Nickelodeon announced plans to bring back some of its most beloved properties, a move that’s coming to fruition sometime in the semi-near future with a Craig Bartlett-penned Hey Arnold! movie. But what does that actually mean? Are we getting an updated Clarissa Explains It All starring a 40-year-old Melissa Joan Hart, or is Nickelodeon going to completely reanimate the Rugrats, à la the recent Peanuts Movie? For specific answers, The A.V. Club decided to consult The Adventures & Pete And Pete co-creator Chris Viscardi, who Nickelodeon recently named its senior vice president of content development for franchise properties. It’s a big title, and it means Viscardi will be examining old and much beloved Nick properties to figure out how (and if) the network can bring them back for a new generation. The A.V. Club talked to him about that process, the Hey Arnold! revamp, and what else fans can expect on the immediate horizon. The A.V. Club: How is Nickelodeon viewing this new endeavor? Is the network bringing back shows for thirtysomethings, or for current Nick viewers? Chris Viscardi: Everything that we do, we want to appeal to kids, 2 to 11 years old, so that’s first and foremost what we’re after when we open our library vault, so to speak. We think about what properties may be worth reimagining in some way. The first thing we think about is, “What is a kid today going to think about this?” That’s the biggest thing that we look at. We wouldn’t be looking at any show if it weren’t beloved back in the day and beloved now as well, and as you know there’s a real millennial love for a lot of these classic series. We have fans that were once kids that are still fans of shows even as adults, so certainly we want to appeal to them, but first and foremost we want to make sure that we’re making something that is really exciting and new and accessible to our kid-fan audience before we worry too much about what the adults are going to think. If we get adults, fantastic. If we get teenagers, fantastic, but it’s kids that we’re looking for. AVC: This is purely a devil’s advocate question, but if you want to make shows for kids who have never heard of Hey Arnold!, why not just make new shows instead of re-making Hey Arnold!? CV: I understand the question. The reality for us is we have 13 brand-new original shows either on the air or in production that will soon be on the air, and so Nickelodeon has been making and is making more original animated content right now than we have in a really, really long time. We’ve got 35 to 40 shows in development, so original shows are ultimately what we’re all about. We also have this amazing library that we’ve amassed over the last 25 years, and as we just talked about, there’s a lot of love for those classic properties. Hey Arnold! is the obvious example. There’s something so wonderful about that show from back in the day about what it was, about the way it talked to a kid audience—there’s still something in there that we think kids today would really love, so that’s partly how we’re looking at these classic series. But we’re making a ton of new animation all the time, and that’s always what we’re going to be doing. To us, something like Hey Arnold! is something that we’re eager to explore, as well as other properties that we’re considering. We’re just making [Hey Arnold!] specials and a TV movie, or maybe a miniseries of those classic shows. We’re not bringing them to series. That’s not the intent when we bring these things back. We’re bringing them back as these one-off events. Now, down the line, if they’re incredibly successful, we’ll think about turning some of them into series. That obviously would be a consideration we would make, but it’s not our goal when we open up the vaults and decide to reimagine one of these as a special. AVC: Do some shows adapt better than others? Hey Arnold! could make an easy transition into 2015, but other shows like You Can’t Do That On Television might not translate as well. CV: I guess we’ll figure that out as we go through it. The reality is that right now, because next year is the 25-year anniversary of Nicktoons—in 1991, Doug, Rugrats, and Ren & Stimpy launched—next year is a really big anniversary for us, so we’re really only focused on animation right now. There have been some live-action properties that’ve been discussed and they have been talked about somewhat here and there, but it’s animation that we’re really focusing on, in part for that celebration that we’re doing next year and in the years beyond. We’re not that deep into the process yet, so I don’t really know what makes one ultimately turn out to be successful as a reboot and what might not. One of the biggest considerations is, if we look at one of those past properties and we think it has a lot going for it in terms of present-day kid-fan appeal, the second most important thing to us is the original creator. Do they want to come back and do something with it? If the original creator does not want to, we’re not going to go anywhere near it, because we only want to use the original creators that brought these things to life originally the first time around. We’re only going to do these shows if those original creators come back and lead us down the path toward this next kind of iteration of their property. So, we’re really fortunate with Craig Bartlett because not only is he a great guy—we’ve all known him here for a long time and he’s a really wonderful collaborator—but when we spoke to him initially, he had a story that he wanted to tell about Hey Arnold! and as people have been talking about recently, that’s obviously something to do with Arnold’s parents. It was a very specific story, a continuation of the Arnold story that Craig wanted to tell. So that just made it very easy for us to say yes to Hey Arnold! and yes to what Craig’s vision was. I don’t know whether others have that same perspective on their shows yet. We’re not that far down the path with people yet, but we can only hope. AVC: That creator issue sounds like something you might be particularly sensitive to, given your background. CV: Absolutely. Also, I was here back in the early days when a lot of these shows were being made, so I know a lot of these creators and from the Pete & Pete reunions that we’ve done over the years, I understand what it’s like to take a step back into the past and get close to that thing that you made so long ago, and it’s really wonderful. It’s incredibly satisfying, and you feel really good that something that you made long ago is still in some ways even more beloved than it was back in the day. Because I’ve had that experience professionally myself, I’m very sensitive to doing that with past properties, and bringing them back to life in a slightly new and special form. I really want it to be handled properly, and with sensitivity and a lot of care, and that’s why the role of that original creator is really, really, really important. They’ll steer the ship. They’ll know exactly how far they want to go, and what kind of territory they want to explore emotionally and plot-wise. I just hope to be there for them to guide them along the way as another sensitive, thoughtful hand. So far with Craig it’s been a great collaboration between us and him, and we’ve given him a lot of room to explore where he might want to go with Arnold! in this two-part special or miniseries that we may do with him, this one-off, but we’re leaving it up to him and we’re there for him along the way. AVC: Is Nickelodeon going to run old Hey Arnold! episodes before the movie? How do you introduce a new audience to an old show? CV: That’s a good question. I don’t think so. We haven’t gotten there yet in terms of what the programming help will be in terms of getting audiences caught up, but in our creative conversations with Craig Bartlett, we have focused on introducing a new audience to Arnold right from the beginning. And really that just means introducing the audience to Arnold and this really great world that he lives in with his grandparents and Abner The Pig and Gerald and Helga and Phoebe and all the others as well as all the things that we need plot-wise and emotionally and character-wise for that story to take off from there. We feel really confident that we can do that just in the confines of the story that we’re going to tell, and that you’re not going to need five years of Hey Arnold! prep before the movie begins. AVC: In the original Variety article about this re-launch, it mentioned that a show like Hey Arnold! would have to be tweaked for today’s audiences. What do audiences now need or want that audiences in, say, 1998 didn’t? CV: Well, the things that we know kids love now are the same things that we loved back in the day. They love great stories, they love comedy, they love humanity, and they love that Nickelodeon personality and point of view that we uniquely have on stuff, so that’s going to be there, and ultimately that’s going to be the biggest draw to it. When we talk about re-imagining these things for a new generation, to us that really only means if there any design things here or there—ideally probably just small things that the creator may want to do just to update the look and feel a little bit—it’s been, for some of these series, quite a long time—that’s really all the re-imagining that will be done. One thing I’ll add to what we were just talking about is like—you know Nick really well. You know the current shows as well as you know the past shows. The DNA of the shows that were made long ago is alive and well in the shows that we’re making now. Like Sanjay & Craig, they’re very much from the Ren & Stimpy, Rocko kind of world—just irreverent, anarchic, there’s a punk spirit to it and it’s just kind of weird and wonderful. And then Hey Arnold! and Rugrats and Doug, those are there in shows like Harvey Beaks. I bring that up because those are really great examples of how stuff we made in the past really influences the stuff that we’re making now. That’s another great reason why we don’t think it’ll be that difficult for today’s audience to relate to and long for a character like Arnold or his friends, because the DNA of Arnold is in all the stuff they’re watching now. AVC: Here’s a question you won’t be able to answer: What’s next? What’s coming after Hey Arnold!? CV: Well, you’re right. I won’t be able to answer that. We don’t really know. We’re talking to some various creators about doing certain things with us and we’re moving forward with some of them and it’s a process, as we talked about earlier. It’s a very sensitive thing. It’s something that we want to do right and that the creators want to do right, and figuring out the right way to do that is really important to both sides, so we’re just taking our time with it and taking what comes, and hopefully they’ll all be as easy as the collaboration thus far with Craig Bartlett has been.